We have just returned from FIBO 2019 the biggest fitness trade show in the world, and our favourite show to do all year! This year we teamed up with Frog Fitness, Inertia Wave and Thin Air Sports to bring a collaboration of some of the most unique and versatile training equipment in the entire show. The stand was packed from start to finish with an eclectic mix of visitors from all corners of the globe. FIBO for us is such a unique opportunity to meet up with friends and form the start of long lasting business relationships. We were fortunate enough to have our products on our other partners stands to. The Pulse Group and Jerai Fitness, thus maximising the exposure of our products and receiving phenomenal feedback all round. Thank you for everyone that came to the booth, to Joel, Dave, Sam and Stu and all of our partners! This years FIBO was the best yet and we can’t wait for the next one. Last week we were in the USA for FIBO Orlando and to install a Limitless Free Trainer Pro, Hack Squat and Leg Press at the Rooney Sports Complex. The training facility for the Pittsburgh Steelers. 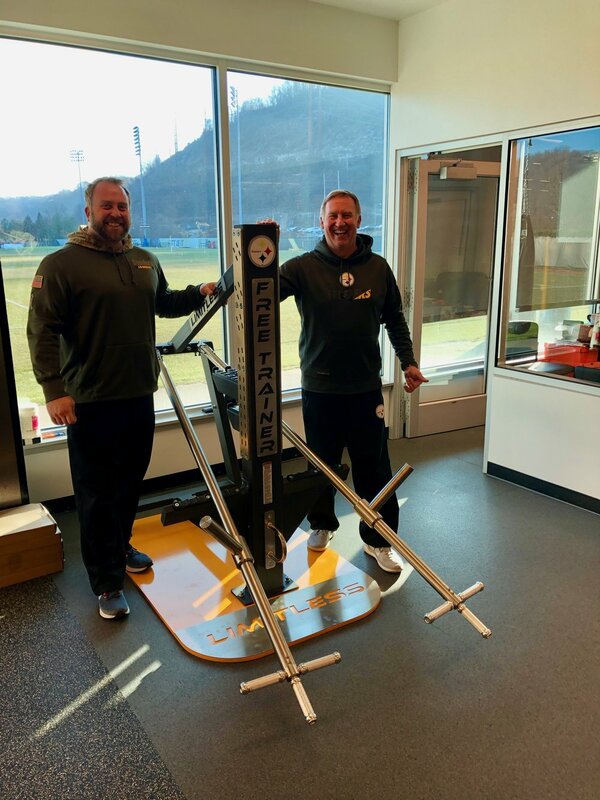 The Free Trainer Pro in particular wowed Garrett Giemont, Strength and conditioning coordinator at the Steelers. It was a pleasure to meet the guys, and look around such an incredible facility. We know our equipment will be put to great use. Good luck for the rest of the season! Back in October we flew to Mumbai for the IHFF Expo with our friends Frog Fitness. The expo was very busy from start to finish with young and eager to learn fitness enthusiasts that kept us on our toes. By the end of the weekend we were exhausted but it was all worth it to receive such a positive response from the other side of the world on our equipment and demonstrate the capabilities of our products to potential buyers. The fitness industry in India is growing at an immense pace and we are grateful to be part of it. Copyright © 2019 GOPROGYM LTD. All rights reserved.